Sirius XM Radio For BlackBerry Released | BlackBerry Blast! Although rumors of Sirius XM Radio coming to the BlackBerry have been around for awhile, nothing was materializing. Now, some people in the CrackBerry forums spotted the news on the Sirius web site. 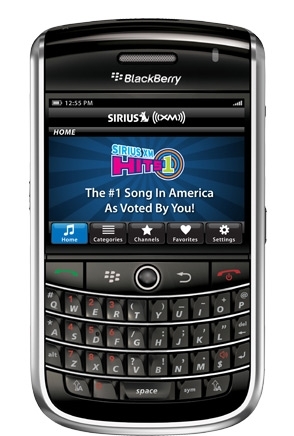 Sirius XM Radio for the BlackBerry is a reality and you can pick it up at the link below. You'll get a 7 day trial with the app but then you'll have to sign up for a subscription if you want to keep using it. The app works on the BlackBerry Curve 8500 & 8900, BlackBerry Bold 9000 & 9700, and BlackBerry Storm 9530 /Storm2 9550. "120 channels of exclusive music & live performances � all commercial-free. 24/7 sports talk channels such as NFL Radio and MLB Home Plate. Comedy channels including The Virus with Opie & Anthony, The Foxxhole produced by Jamie Foxx, and Raw Dog comedy with Jim Breuer. Talk and entertainment channels, including Oprah and Martha Stewart. World-class news from partners such as CNN, Fox News, and NPR."